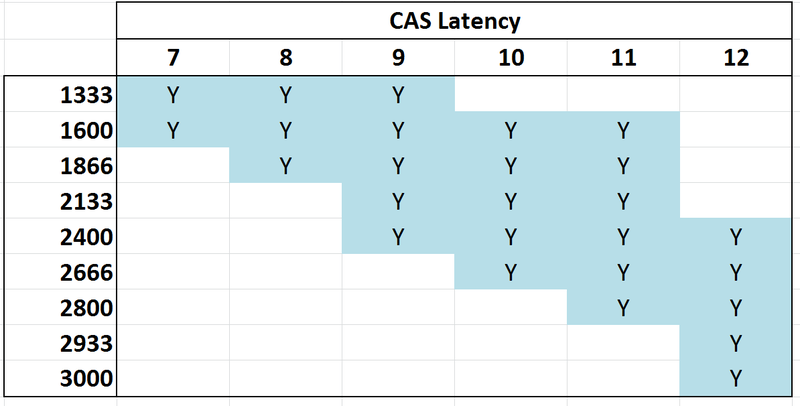 ‘How much does memory speed matter?’ is a question often asked when dealing with mainstream processor lines. Depending on the platform, the answers might very well be different. Similar to our comparisons with Ivy Bridge, today we publish our results for 26 different memory timings across 45 benchmarks, all using a G.Skill memory kit. In our previous memory scaling article with an Ivy Bridge CPU, the results of memory testing between DDR3-1333 to DDR3-2400 afforded two main results – (a) the high end memory kit offered up to a 20% improvement, but (b) this improvement was restricted to certain memory limited tests. In order to be more thorough, our tests in this article take a single memory kit, the G.Skill 2x4GB DDR3-3000 12-14-14 1.65V kit, through 26 different combinations of memory speed and CAS latency to see if it is better to choose one set of timings over the other. Benchmarks chosen include my standard array of real world benchmarks, some of which are memory limited, as well as several gaming titles on IGP, single GPU and multi-GPU setups, recording both average and minimum frame rates. In order to take advantage of the number of memory channels of the CPU we must have a number of sticks that have a factor of the memory channels (point 2), known as dual channel/tri channel/quad channel. If the MHz of the memory is more than CPU is rated for (1333, 1600, 1866+), then the user needs to apply XMP/AMP in order to benefit from the additional speed. Otherwise the system will run at the CPU defaults. Subtimings, such as tCL, are used in conjunction with the MHz to provide the overall picture when it comes to performance. 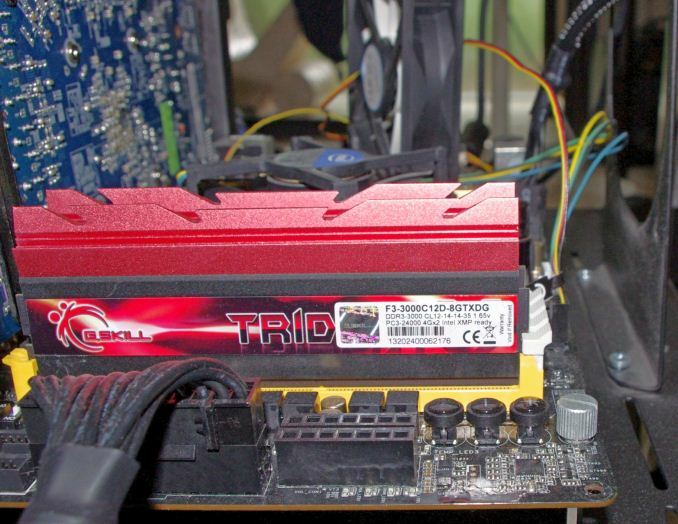 A user can go out and buy two memory kits, both DDR3-2400, but in reality (as shown in this review), they can perform different and have different prices. The reason for this will be in the sub-timings of each memory kit: one might be 9-11-10 (2400 C9), and the other 11-11-11 (2400 C11). So whenever someone boasts about a particular memory speed, ask for subtimings. 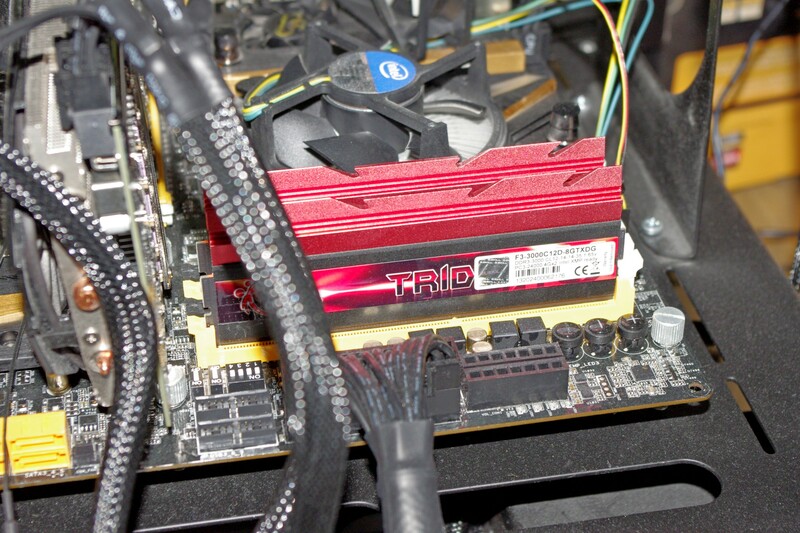 For this review, G.Skill supplied us with a pair of DDR3 modules from their TridentX range, rated at DDR3-3000. This is at the absolute high end of memory kits, with very few memory kits going faster in terms of MHz. Of course, in this MHz race, it comes at a price premium: $690 for 8 GB. This memory kit uses single-sided Hynix MFR ICs, known for their high MHz numbers, and while there are large heat-spreaders on each stick, these can be removed reducing the height from 5.4 cm to 3.9 cm. Hynix MFR based memory kits are used by extreme overclockers to hit the high MHz numbers. Recently YoungPro from Australia took one of these memory sticks and hit DDR3-4400 MHz (13-31-31 sub-timings) to reach #1 in the world in pure MHz. Almost all of these combinations are available for purchase. For any combination of MHz and CAS, we attempt that CAS for all sub-timings, e.g. 2400 9-9-9 1T at 1.65 volts. If this setting is unstable, we move to 9-10-9, 9-10-10 then 9-11-10 and so on until the combination is stable. There is an odd twist when dealing with DDR3-3000. In order to reach 3000 MHz, as Haswell does not accept the DDR3-3000 memory strap, we actually have to use the DDR3-2933 strap and boost the CPU speed to 102.3 MHz. This leads to a slight advantage in terms of CPU throughput when using DDR3-3000 which does come through in several benchmarks. In order to keep things even, our 4.0 GHz CPU has the multiplier reduced for 3000 C12 in order to keep the overall system speed the same, albeit with a slight BCLK advantage. At the time of testing, DDR3-3000 C12 was the highest MHz memory kit available, but since then there are now 3100 C12 memory kits on the market taking price margins even higher at $1000 for 8 GB. The problem at this speed is the actual overclocking of the CPU aspect of the system will skew the performance results in favor of the high end kit. For what should be obvious reasons, there is no point in running synthetic tests when dealing with memory. A synthetic test will tell you if the peak speed or latency is higher or lower – that is not a number that necessarily translates into the real world unless you can detect the type and size of all the memory accesses used within a real world environment. The real world is more complex than a simple boost in memory read/write peak speeds. For each of the 3D benchmarks we use an ASUS HD 6950 (flashed to HD6970) for the single GPU tests, the HD 4600 in the CPU for IGP, and a HD 5970+5870 for a lopsided tri-GPU test. Firstly, I want to go through enabling XMP in the BIOS of all the major vendors. Enabling XMP with ASUS, GIGABYTE, ASRock and MSI on Z87 Memory Scaling on Haswell: DDR3-1333 to DDR3-3000 Tested with G.Skill Enabling XMP with ASUS, GIGABYTE, ASRock and MSI on Z87 Memory Scaling on Haswell: CPU Real World Memory Scaling on Haswell: CPU Compute Memory Scaling on Haswell: IGP Compute Memory Scaling on Haswell: IGP Gaming Memory Scaling on Haswell: Single dGPU Gaming Memory Scaling on Haswell: Tri-GPU CrossFireX Gaming Pricing and the Effect of the Hynix Fire Conclusions: Do you need a 3000 MHz C12 memory kit?